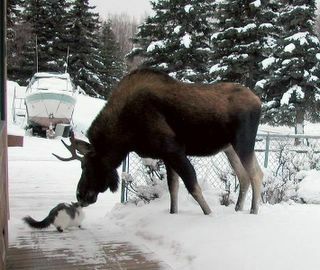 Give a Moose a Muffin...: Look what I grew! I saw this vegetable at the Farmer's Market last summer and this summer I just had to try to grow it :) It's called Romanesco. It is sort of a cauliflower and it is sort of a broccoli. I planted six of them and two never grew but the other four have been getting bigger and bigger leaves on them since the very first week. Today I went outside to check on the things (got stung by two different bees in the process) and discovered they are growing. Are they not just the strangest looking plant ever but at the same time just crazy cool?!?! I think I would be afraid to eat that! they are crazy looking! i want to know what they taste like when you harvest and cook them.